Guinea pigs (Cavia porcellus) can be notably demonstrative and communicative rodents. As far as common vocalization styles go, growls and coos are just a couple of ways that cavies go about sending messages, whether to each other or to the key human beings in their lives. Growling thankfully isn't too common in guinea pigs, although it does happen once in a while. Cavies typically growl when they're frightened and feel like they have no way out of an uncertain situation. They often growl when they're on the verge of fierce behavior, like biting. When guinea pigs growl, they frequently grind their teeth, as well. If you ever notice your guinea pig growling or teeth grinding, give him some time to himself. Context can often be helpful for identifying growling in guinea pigs. If your guinea pig has any reason to be apprehensive, irritated or anxious at the moment, there's a big chance that he's growling. Guinea pig coos are the complete opposite of growls. While their growls generally signify vexation and upcoming truculence, their coos have decidedly more pleasant purposes. When a guinea pig coos at another, she's often trying to calm him. Guinea pig mamas frequently coo to their youngsters. It isn't even unheard of for cavies to coo to the people they adore the most. The sound usually denotes serenity, love and happiness -- a far cry from the aggression and alarm of growls. As with growling, context often is handy for pinpointing cooing in guinea pigs. If you're stroking your guinea pig's back, she might be cooing. If she's looking after for her pups, she might be cooing, too. Outside of context, the actual sounds of growling and cooing can also be helpful for accurately differentiating between them. Guinea pig growls are extremely low, gruff and throaty. Guinea pig coos, on the other hand, sound nothing like that. Their coos come across a lot like smooth murmurs. When guinea pigs coo, it has a light and tranquil effect. The world of vocalizations in guinea pigs goes beyond just growling and cooing sounds. The cuties do a lot of squealing, for one. Squealing can indicate a variety of different emotions and situations, from physical pain to loneliness for Mama's company in juveniles. 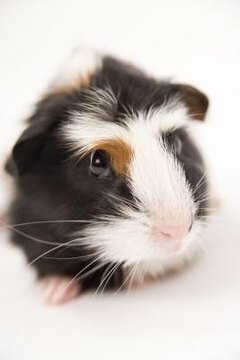 Purring is another typical sound for guinea pigs. When guinea pigs purr, it usually means that they're satisfied and at ease with things. Remember, cavies aren't the most silent critters around. The latter part of their name is thought to describe their noises, which are comparable to the high-pitched sounds that pigs make. Guinea pigs aren't really pigs, after all.